Dr. Farrah Agustin-Bunch used to run a very busy clinic north of the Filipino capital city of Manila until late last summer. In August 2018 Dr. Farrah’s clinic was raided at gunpoint by Filipino authorities and she was forced to shut down the clinic. Dr. Farrah was forced to flee her home country. Dr. Farrah’s patients sought her out to treat cancer and chronic disease, most after trying and failing with traditional pharmaceutical options. Not only is Dr. Farrah a trained medical doctor, but she also grew up learning about herbalism and natural medicine from her father, Antonio Agustin, who had developed a line of herbal products that she has since improved and promoted in practice. The products she developed were the linchpin of the government’s case against her. Despite nationwide legislation promoting the use of traditional herbal medicines, specifically the Tradition and Alternative Medicine Act of 1997 (TAMA) which states the goal of the Filipino government to “improve the quality and delivery of health care services to the Filipino people through the development of traditional and alternative health care and its integration into the national health care delivery system” the nation currently has a chaotic and bloody approach to regulating both legal and illegal medical substances. Just like in the United States and most of the modern world, the lack of proprietary ownership of medicinal plants found in nature has led to international policies discouraging their use or discrediting their abilities. The War on Drugs has always been international because of supply and demand for all drugs is international. But in the last two years, the Philippines has waged one of the bloodiest drug wars against its own people on the planet. Since taking office in 2016, President Rodrigo Duterte has overseen the extrajudicial execution (ie: state-sanctioned murder) of over 5,000 Filipinos who dealt, possessed and/or used illegal drugs – or was simply accused of it. Feeling it was no longer safe in the Philippines for her to practice natural medicine, Dr. Farrah and her family set out exploring the United States to find a new home and landed in Oklahoma. Today she is working with patients in the Sooner State as well as developing a line of cannabis oils with local producer Can-Tek Labs. She hopes that cannabis can bring about a revolution in natural medicine and care. OUNCE MAGAZINE: How did you end up choosing to live in Oklahoma? DR FARRAH: We needed to leave the Philippines quickly and decided our emergency relocation would be to Austin, Texas because my husband was familiar with the area, but a funny thing happened on the way to Austin! While we were passing through Oklahoma, we liked what we saw here and decided that for our family, Oklahoma is OK! OM: How do you see cannabis changing the way people look at their healthcare in Oklahoma? DF: One of the biggest healthcare issues regarding cannabis has been the long term and consistent denigration of cannabis by the media. It’s been a very effective public relations campaign to demonize one of the most useful and therapeutic plant varieties in the world for the benefit of pharmaceutical interests. Nowadays, we’re very fortunate to have a proliferation of accessible scientific data on the overwhelming evidence supporting cannabis and its considerable benefits. This has led many Oklahomans to a forward-thinking stance on the issues of cannabis as an integral part of an effective statewide healthcare system simply based on the evidence. This presents a genuine opportunity for Oklahoma to serve as an example for the future as a truly integrative healthcare system on a large scale. Natural, safe and scientifically proven therapeutics such as cannabis should always be considered as front-line treatment options. If we as doctors are truly giving informed consent to patients, then evidence-based medical decisions and treatment options for patients should highlight cannabis benefits instead of simply focusing upon pharmaceuticals, especially in the areas of pain management. When medical interventions are guided by marketing and dogmatic beliefs instead of solid scientific data, then health science policy has gotten ahead of actual health science. That is the state of modern medicine we find ourselves in. OM: You advertise, “I believe that everyone has the right to visit with a world-class medical doctor without paying anything at all. That’s why every check-up, consult, exam, and visit with our doctors is ALWAYS 100 percent free. No one is ever required to spend a single peso [Filipino currency] here. My concern is patient outcomes, not income. God has given me healing knowledge, and I am compelled to share it with my patients because I love them all.” Why is this an important part of what you do? DF: I’ve always felt that my focus needed to be on my patient outcomes instead of my patient income. Most of what I prescribed in the Philippines were natural, evidence-based medicinal plants that people could source themselves for little or no money at all. 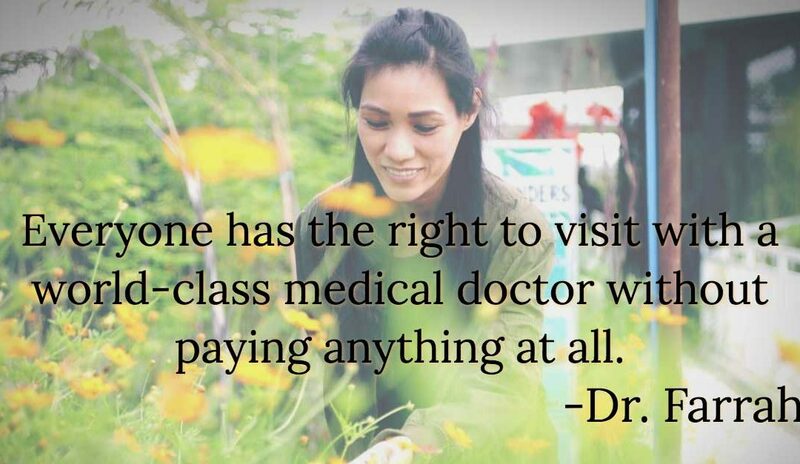 I never wanted a lack of money to keep people from visiting a doctor, so I decided when I became a doctor that I wouldn’t charge “professional fees” of any kind. Many people avoid doctors because they’re more afraid of the cost of the doctor visit than they are of the potential illness. I invented several specialized products for problems like cancer, but nobody was ever obligated at my facility to spend for anything. Many did, simply because of the irrefutable track record of treatment successes that I was able to generate from my protocols and products during my 15 years in clinical practice and experience in treating 150,000 patients. OM: President Rodrigo Duterte has waged an incredibly violent war on illegal drugs in the Philippines, in light of this aggression towards users of street drugs and a national policy meant to support and promote natural herbal medicines, can you put the raid on your clinic into perspective? What is the inconsistency in the policy? DF: More Filipinos have died from high speed, high impact lead poisoning from our police for possessing and trading in cannabis than would ever die from using it. According to the U.S. Drug Enforcement Agency, cannabis has killed exactly zero people ever in the history of the world. The Philippines “official” national policy to promote natural medicines comes down to scarcely more than lip service, unfortunately. The Department of Health and FDA are legally mandated to promote natural medicine as part of the TAMA, yet they illegally raided my facility with 50 heavily armed (with machine guns), combat-ready police at the behest of nine pharmaceutical companies and five medical societies without a sniff of due process or jurisdiction because my clinic was just far too effective. My facility was seeing about 500 patients per day which were significantly affecting the bottom line of many hospitals, clinics, oncologists and pharmaceutical companies. People would come from all over the world daily to be treated; famous actors, politicians, former heads of state and even royalty. No matter who people are or where they’re from, they just want to live and will go where they feel they can get the best results. I believe that what’s far more important than a patient’s will to fight their illness is for them to actually have a fighting chance with their choice of treatment modality. My extensive experience has demonstrated that natural medicine provides many with that fighting chance. OM: In what ways do you plan to be part of the cannabis community in Oklahoma? Do you find Oklahomans are open to natural medicine? DF: I simply want to be a resource to the Oklahoma cannabis community. I’m establishing a knowledge base of experts in the industry so that lay people can get real answers when it comes to their questions regarding cannabis and its’ broad spectrum of uses. Oklahomans are far more open to natural medicine than my medical peers in the Philippines. Glad she is safe and continuing her healing journey! I’m glad she’s here. I also really like you letting natural doctors be known, would appreciate more of them if you can find them please.